Mazda is a Japanese vehicle manufacturer that produces sports cars, family cars, and trucks, many with a performance focus. It was founded in 1920 by Toyo Cork Kogyo Co., Ltd. and evolved from manufacturing tools to cars, with the exception of building weaponry during World War II. Mazda is known for its early adoption and continued use of the rotary engine. Mazda first featured the rotary engine in its 1967 Cosmo Sport. Now, more than four decades later, the company produces rotary engines for use in its RX-8 sports car; it is the only car manufacturer to still produce the engine. In 1970 Mazda made its U.S. debut with the R100 coupe, the first mass-produced rotary-powered vehicle. With the onset of the 1970s fuel crisis, however, the rotary's comparatively poor fuel mileage made it less competitive then conventional piston engines, forcing the company to de-emphasize the rotary. With the 1978 debut of the popular, affordable RX-7 sports car, however, the company and the rotary engine really hit their stride. The rotary's compact dimensions and smooth power delivery perfectly suited a sports car application, and the RX-7 was an immediate hit. The RX-7 line was a popular performance car until its eventual demise in the 1990s; today's rotary-powered RX-8 lives on as its spiritual successor. Mazda's other huge sports car hit, the MX-5 Miata, launched to worldwide acclaim in 1989 as a reliable Japanese interpretation of the classic English roadster. The car earned multiple awards, including recognition from the Guiness Book of World Records as the "best-selling roadster of all time" in 2000. Mazda also applied its technology to racing; in 1991 the company's 787B racer became the first Japanese-made and rotary-powered car to win the 24 Hours of Le Mans. To address growing financial concerns, Mazda partnered with Ford Motor Company in 1979, with Ford acquiring a 27% stake in the company. Ford's investment grew over time, as did its joint vehicle projects with Mazda. Mazda opened a new plant in Flat Rock, Mich., in 1987, and the Mazda MX-6 and Ford Probe sports coupes were both built in that facility. Mazda helped Ford develop the Explorer, and Ford shared its Ranger design to launch the Mazda B-Series trucks in 1994. A recent joint project between Mazda and Ford was the 2001 Ford Escape and Mazda Tribute; the Escape was one of the first hybrid SUVs. In 1996 Ford acquired enough stock to take controlling interest of Mazda; in the same year, the first non-Japanese CEO took charge. Henry Wallace was tasked to restructure the organization and focus on defining the brand while maintaining its partnership with Ford. Mark Fields, a Ford executive, took over as CEO in 1998. 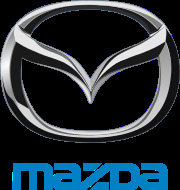 Mazda subsequently defined its brand with the "Zoom-Zoom" advertising tagline in 2000, which portrayed Mazdas as entertaining cars to drive. Since then, Mazda's new products have continued to push the company's peppy, performance-oriented image. The popular Mazda6 family car and Mazda3 compact car debuted in 2003 and 2004, respectively, replacing the previous 626 and Protégé. The Mazda5 compact SUV arrived in 2005, and the CX-7 and CX-9 crossover vehicles debuted in 2007. In Nov. 2008 Ford sold a portion of its stake in Mazda, losing its controlling interest in the company. Takashi Yamanouchi, a Mazda VP, was named President and CEO of Mazda in the same month.